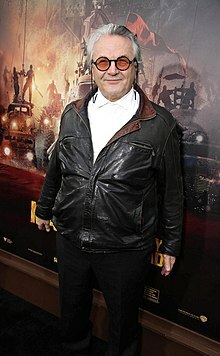 George Miller AO (born 3 March 1945) is an Australian-Greek filmmaker and former physician. He is best known for his Mad Max franchise, with The Road Warrior and Fury Road being hailed as amongst the greatest action films of all time. Aside from the Mad Max films, Miller has been involved in a wide range of projects. These include the Academy Award-winning Babe and Happy Feet film series. Miller is a co-founder of the production houses Kennedy Miller Mitchell, formerly known as Kennedy Miller, and Dr. D Studios. His younger brother Bill Miller and Doug Mitchell have been producers on almost all the films in Miller's later career, since the death of his original producing partner Byron Kennedy. In 2006, Miller won the Academy Award for Best Animated Feature for Happy Feet (2006). He has been nominated for five other Academy Awards: Best Original Screenplay in 1992 for Lorenzo's Oil, Best Picture and Best Adapted Screenplay in 1995 for Babe, and Best Picture and Best Director for Fury Road in 2015. Miller was born in Brisbane, Queensland, to Greek immigrant parents: Dimitri (Jim) Castrisios Miller and Angela Balson. Dimitri was from the Greek island of Kythira, and anglicised his surname from Miliotis to Miller when he emigrated to Australia; the Balson family were Greek refugees from Anatolia, displaced by the 1923 population exchange. The couple married and settled in Chinchilla and had four sons: fraternal twins George and John, Chris, and Bill. George attended Ipswich Grammar School and later Sydney Boys High School, then studied medicine at the University of New South Wales with his twin brother John. While in his final year at medical school (1971), George and his younger brother Chris made a one-minute short film that won them first prize in a student competition. In 1971, George attended a film workshop at Melbourne University where he met fellow student, Byron Kennedy, with whom he formed a lasting friendship and production partnership, until Kennedy's death in a helicopter crash in 1983. In 1972, Miller completed his residency at Sydney's St Vincent's Hospital, spending his time off crewing on short experimental films. That same year, Miller and Kennedy founded Kennedy Miller Productions. The pair subsequently collaborated on numerous works. After Kennedy died in 1983, Miller kept his name in the company. It was later renamed Kennedy Miller Mitchell in 2009 as a way to recognize producer Doug Mitchell's role in the company. Miller's first work, the short film Violence in Cinema: Part 1 (1971), polarised critics, audiences and distributors so much that it was placed in the documentary category at the 1972 Sydney Film Festival due to its matter-of-fact depiction of cinematic violence. In 1979, Miller made his feature-length directorial debut with Mad Max. Based on a script written by Miller and James McCausland in 1975, the film was independently financed by Kennedy Miller Productions and went on to become an international success. As a result, the film spawned the Mad Max series with two further sequels starring Mel Gibson and a third starring Tom Hardy; Mad Max 2 also released as The Road Warrior (1981), Mad Max Beyond Thunderdome (1985) and Mad Max: Fury Road (2015). During the time between the second and third Mad Max films, Miller directed a remake of "Nightmare at 20,000 Feet" as a segment for the anthology film Twilight Zone: The Movie (1983). He also co-produced and co-directed many acclaimed miniseries for Australian television including The Dismissal (1983) and The Cowra Breakout (1984). In 1987, Miller directed The Witches of Eastwick, starring Jack Nicholson, Susan Sarandon, Cher and Michelle Pfeiffer. The film, a black comedy, was centred around three women whose magical power is released after they meet a millionaire bachelor in a puritanical and wealthy New England town. The Witches of Eastwick proved to be a troubling experience for Miller. "I quit the film twice and Jack [Nicholson] held me in there," said Miller. "He said just sit down, lose your emotion, and have a look at the work. If you think the work is good, stick with the film, and he was a great man. I learnt more from him than anybody else I think I’d worked for – he was extraordinary." Following The Witches of Eastwick, Miller focused primarily on producing Australian projects. His role as producer of Flirting, Dead Calm and the TV miniseries Bangkok Hilton and Vietnam, all starring Nicole Kidman, was instrumental in the development of her career. Miller returned to directing with the release of Lorenzo's Oil (1992), which he co-wrote with Nick Enright. In 1993, Miller was hired to direct Contact based on the story by Carl Sagan and Ann Druyan. After working on the film for over a year, Warner Bros. and Miller mutually agreed to part ways and Robert Zemeckis was eventually brought on to direct. Miller also co-wrote the comedy-drama Babe (1995) and wrote and directed its sequel Babe: Pig in the City (1998). Miller was also the creator of Happy Feet, a musical epic about the life of penguins in Antarctica. The Warner Bros.-produced film was released in November 2006. As well as being a runaway box office success, Happy Feet also brought Miller his fourth Academy Award nomination, and his first win in the category of Best Animated Feature. In 2007, Miller signed on to direct a Justice League film titled Justice League: Mortal. While production was initially held up due to the 2007–08 Writers Guild of America strike, further production delays and the success of The Dark Knight led to Warner Bros. deciding to put the film on hold and pursue different options. In 2011, the Happy Feet sequel Happy Feet Two was released. The following year, Miller began principal photography on Mad Max: Fury Road, the fourth film in the Mad Max series, after several years of production delays. Fury Road was released on 15 May 2015. The film was met with widespread critical acclaim and received 10 Academy Award nominations including Best Picture, while Miller himself was nominated for the Academy Award for Best Director. In October 2018, Miller will direct Three Thousand Years Of Longing. Dr. D Studios was a Sydney-based digital animation studio founded in mid-2007 as a partnership between Kennedy Miller Mitchell and Omnilab Media. Following the financially unsuccessful release of Happy Feet Two (2011) and the long delay of Mad Max: Fury Road (2015), the studio closed down in 2013. His legacy includes his unrealized projects. Miller was married to actress Sandy Gore; they have a daughter Augusta. He married film editor Margaret Sixel in 1995; they have two sons. The two initially met during the production of Flirting,[dubious – discuss] and Sixel has since worked on all of Miller's directorial efforts in some capacity. Miller is the Patron of the Australian Film Institute and the BIFF (Brisbane International Film Festival) and a co-patron of the Sydney Film Festival. Miller has said on multiple occasions that the 1940 version of Pinocchio is one of his favorite films. Miller identifies as a feminist, having told Vanity Fair in May 2015, "I've gone from being very male dominant to being surrounded by magnificent women. I can’t help but be a feminist." 2007 (April): Awarded an honorary Master of Arts degree by the Australian Film Television and Radio School. 2008: Awarded an honorary Doctorate from the Griffith University. 2009: Awarded the French Order of the Arts and Letters. 2010: First non-US Filmmaker to be awarded "honorary member" status among the VES. 2016: Served as President of the Jury for the Palme d'Or at the 69th Cannes Film Festival. 2018: Inducted into the Queensland Business Leaders Hall of Fame. ^ a b "George Miller". Kythera-Family.net. 22 May 2004. Retrieved 30 June 2011. ^ a b Moran, Albert; Vieth, Errol (21 July 2009). The A to Z of Australian and New Zealand Cinema. Lanham, Maryland: Scarecrow Press. p. 174. Retrieved 10 May 2015. ^ "George Miller's New Script". The Australian Financial Review. Fairfax Media. 25 November 2011. Retrieved 8 May 2015. ^ Canby, Vincent (24 June 1983). "'Twilight Zone' is Adapted to the Big Screen". The New York Times. The New York Times Company. Retrieved 10 May 2015. ^ Denton, Andrew (20 October 2008). "Enough Rope with Andre Denton - Episode 190: George Miller". Enough Rope. Australian Broadcasting Corporation. Archived from the original on 2 April 2016. Retrieved 10 May 2015. ^ Dutka, Elaine (30 December 1992). "INTERVIEW : The Spark That Gives 'Oil' Its Heat : Movies: Director George Miller follows his passion and gambles on a long-shot--a medical mystery story". The New York Times. The New York Times Company. Retrieved 10 May 2015. ^ Pender, Anne; Lever, Susan (30 September 2008). Nick Enright: An Actor's Playwright. Amsterdam: Rodopi. p. 23. Retrieved 12 May 2015. ^ Head, Tom (5 January 2006). Conversations with Carl Sagan. Jackson, Mississippi: University Press of Mississippi. p. 89. ^ Chitwood, Adam (8 May 2015). "George Miller Talks His Version of CONTACT; Likens It to INTERSTELLAR". Collider. Complex. Retrieved 8 May 2015. ^ Cox, Dan (12 November 1997). "U turns production corne". Variety. Penske Media Corporation. Retrieved 12 May 2015. ^ "The penguin suite". The Sydney Morning Herald. 2 December 2006. ^ Garrett, Diane (20 September 2007). "George Miller to lead 'Justice League'". Variety. Penske Media Corporation. Retrieved 8 May 2015. ^ Michaela, Boland (17 January 2008). "Australia denies killing 'Justice League'". Variety. Penske Media Corporation. Retrieved 8 May 2015. ^ Graser, Marc (15 August 2008). "WB taps into ties at DC Comics". Variety. Penske Media Corporation. Retrieved 8 May 2015. ^ Vlessing, Etan (14 November 2011). "'Happy Feet Two' to Dance Onto 377 Imax Screens". The Hollywood Reporter. Penske Media Corporation. Retrieved 9 May 2015. ^ Moore, Ben (22 May 2012). "Tom Hardy Uncertain About 'Mad Max: Fury Road' Start Date [UPDATED]". Screen Rant. Retrieved 9 May 2015. ^ "'Mad Max: Fury Road' Set For Summer 2015". Deadline Hollywood. Penske Media Corporation. 20 November 2013. Retrieved 9 May 2015. ^ Donnelly, Jim (22 January 2016). "Oscar Nominations 2016: View The Complete List Of Nominees". The Oscars. Retrieved 22 January 2016. ^ Wiseman, Andreas (25 October 2018). 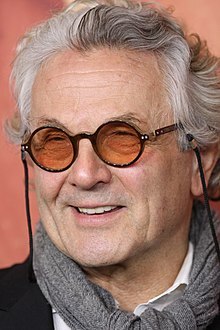 "AFM Hot Pic: George Miller To Direct Movie Epic 'Three Thousand Years Of Longing', FilmNation To Launch Sales". Retrieved 25 October 2018. ^ Forester, Charolette (28 April 2017). "Director George Miller reveals plans to add another two action-packed films to the iconic franchise". Daily Mail (Australia). Retrieved 9 May 2017. ^ a b Cooper, G. (26 April 2017). "Mad Max: Fury Road' has 2 finished sequel scripts already". Cnet reviews. Retrieved 8 May 2017. There are no dates yet, but director George Miller is ready to head out to "The Wasteland" to revisit the 2015 blockbuster hit. ^ McNary, Dave (18 May 2015). "George Miller Promises 'More Max,' Starting With 'Mad Max: The Wasteland'". Variety magazine. Retrieved 9 May 2017. ^ a b Quinn, Karl (31 May 2013). "Happy feet no longer tapping as animation studio sells up". The Sydney Morning Herald. Retrieved 21 March 2014. ^ Swift, Brendan (24 November 2011). "Dr D Studios future clouded after staff departures, restructure". If Magazine. The Intermedia Group. Archived from the original on 18 May 2015. Retrieved 8 May 2015. ^ Turner, Brook (May 2007). "Curious George". The Australian Financial Review: 26–38. Retrieved 9 May 2015. ^ "Feet With Legs". Urban Cinefile. 26 December 2006. Retrieved 9 May 2015. ^ Brand, Madeleine; Pesca, Mike (8 December 2006). "Do Kids' Movies Need More Quality Control?". NPR. Retrieved 9 May 2015. ^ Gilchrist, Todd (16 November 2011). "George Miller Says He Approached 'Happy Feet 2' With The Same Respect As Classic Fairy Tales". Indiewire. SnagFilms. Retrieved 9 May 2015. ^ Eisenberg, Eric (19 November 2011). "Happy Feet Two Director George Miller Talks About Getting The Cast Together". Cinema Blend. Retrieved 9 May 2015. ^ Rich, Katey (14 May 2015). "Mad Max: Fury Road Director George Miller: "I Can't Help but Be a Feminist"". Vanity Fair. Retrieved 2 April 2017. ^ "It's an Honour - Honours - Search Australian Honours". ^ Gadd, Michael (17 April 2007). "George Miller gets Masters". AAP. Archived from the original on 10 May 2007. ^ Braithwaite, Alyssa. "Director George Miller to be awarded Ordre des Arts et des Lettres at Sydney's French Film Festival". Telegraph. ^ "Miller receives VES award – Inside Film: Film and Television Industry News and Issues for Australian Content Creators". If.com.au. Retrieved 30 June 2011. Wikimedia Commons has media related to George Miller.